With fall seasonal goods being replaced with peppermint and eggnog winter variations, it’s a reminder that 2018 is coming to a close. Is your business looking to increase productivity, gain a competitive advantage, or expand into new markets? Acquiring the right equipment to your pressroom can help your operation attain all of the above. Making the decision to add technology to supplement your existing workflow could soon help your bottom line because of Section 179 tax deduction. By understanding the benefits Section 179 can offer your business, the decision to purchase and install before year’s end becomes much clearer. Section 179 gained the attention of businesses, especially those in the label & packaging market, in 2008 because of the Stimulus Act. Ten years ago the Stimulus Act was passed by the United States congress, providing several types of economic stimuli to boost the country’s economy. As a part of the Stimulus Act, Section 179’s aim was to give small businesses an incentive to invest in capital equipment that would grow their businesses. Whether you are in a position to purchase or finance a piece of pressroom equipment, the latest update to 179 has expanded the reach of the tax benefit to encourage companies of all sizes to grow. Any business that purchases or finances capital equipment in the 2018 fiscal year is eligible for the Section 179 tax deduction. The only caveat is that the equipment must be installed and put in service by December 31st, 2018 in order to reap the tax incentives provided by the US federal government. The equipment in question can be either new or used. This gives converters flexibility to add that printing press they truly need to their operation. Whether it is a new standalone piece of equipment or an enhancement to current production units, Section 179 has the ability to support. To see a full list of qualifying purchases, we encourage you to visit Section 179’s website. Put simply, the Section 179 tax deduction allows businesses to abate the full purchase price of qualifying capital equipment purchased or financed during the 2018 tax year. This incentive to buy makes perfect sense if you are looking to enhance your existing equipment, looking into retrofits, or considering adding an entry-level digital press to your business. Take advantage of this incentive, that was created by the US government to encourage small-medium businesses to invest in their companies and equipment to help grow their businesses. To better illustrate how 179 could work for your business we’ve created an example of how a purchase of Digital One, our entry level digital label press could look for a business. 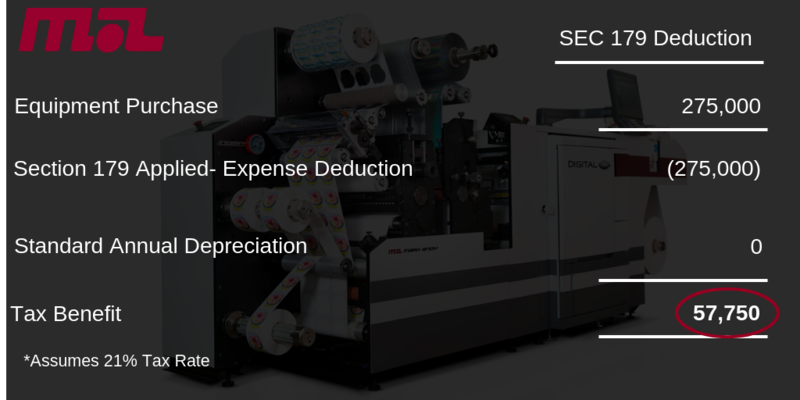 The above chart illustrates potential tax savings associated when purchasing Digital One, an entry-level prime label press suited for short run applications. Adding new equipment is a big decision. Luckily, a clear understanding of tax incentives provided by the United States government can make opening the pocketbook less painful for label and packaging print providers in the United States. At Mark Andy, we work with our customers, helping them add the right technology- flexo, digital hybrid, or a retrofit solution, that will drive profitability. The profitability aspect extends further than operation capacity, however. Our team of financial experts consult customers on the best purchasing and financing options for their business. As the year comes to a close (can you believe it’s already almost November? ), don’t miss this opportunity to add new equipment. What would your company do with a $57,750 tax benefit? Why not invest in an affordable prime label digital press that can help you reach peak profitability on short run work? Or add digital capability to your legacy flexo through the Digital Plus Program? The opportunities are endless and the time to act is now. Equipment must be delivered and installed by December 31st, 2018. This blog post was originally published Dec. 2017 and has since been updated. Note: The information contained in this document is not intended for use without professional tax advice. Please consult your tax adviser or tax professional for further guidance. Applicable to U.S. Companies. Jeff Auton is the Manager of Customer Financial Services for Mark Andy. A long-term veteran of global B2B trade, Jeff specializes in Trade Finance, Business Credit, Risk Management, Underwriting, Treasury and Banking. Jeff is an innovator and problem solver that is passionate about breaking down financial barriers to support internal and external stakeholders of Mark Andy.